Food processing equipment. Food processing equipment. 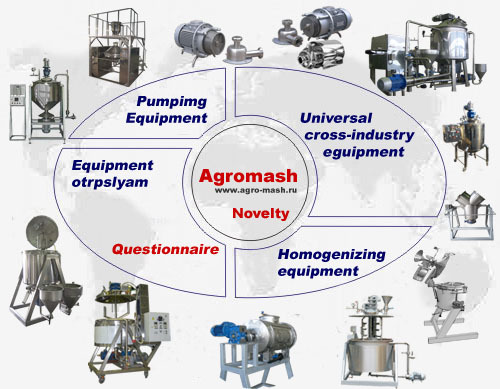 Homogenizing equipment. Food Equipment! Homogenizing equipment! Stainless steel! Vacuum Reactors! VMG-Korum! Mixer type "drunken barrel"! See - New! We manufacture stainless steel tanks, cookers, kettles for cooking meat, vacuum tanks, stainless steel cooking vessel stainless steel vacuum reactor of stainless steel containers food grade stainless steel cooking pots, and kolerovarochnye siropovarochnye boilers, storage tanks, production line of various products, temperosborniki, Vacuum reactors, collections of tempering, buffer tanks, stainless steel mixers loose and dense products (screw mixer, ribbon blender, drum mixer) zhirotopka, melter, dissolvers, vacuum mixers and other equipment for food, cosmetic, pharmaceutical and chemical industries	. Food processing equipment. Food processing, homogenizing equipment siropovarochny boiler, boiler kolerovarochny, food equipment, mixer drunken keg brew pot, stainless steel tanks, vacuum stainless steel tanks, homogenizers, pumps, mixing. We manufacture stainless steel tanks, cookers, pot for cooking meat, vacuum tanks, stainless steel cooking vessel stainless steel vacuum reactor of stainless steel containers food grade stainless steel cooking pot, and kolerovarochnye siropovarochnye boilers, storage tanks, production line of various products, temperosbornik, Vacuum Reactors, collections of tempering, buffer tanks, stainless steel mixers loose and dense products (screw mixer, ribbon blender, drum mixer) zhirotopka, melter, dissolvers, vacuum mixers, and other technological equipment for the food , cosmetic,pharmaceutical and chemical industries.Using years of experience in manufacturing equipment, we offer you a proven unique food and other equipment for the production of condensed milk, fermentation-camp office, brewing, yeast separation, the cylinder-conical tanks (CCT), BBT office, blending department, chocolate glaze, dairy and other food products, cosmeticscreams and ointments, medicines and household chemicals, food processing equipment, dispensers, tank equipment, fasovosnoe equipment, homogenizer, kolerovarochny boiler, dryers, blenders bulk products, Minifactory, fittings, vakuumnanye capacity termotonneli, ultrafiltratsii devices, production lines, proizvodstvao pasty liquid food, chemical and household tools, milk, juice, ketchup, tomato, cheese, cream, condensed milk, food, meat, fish, processing, aerospace, chemical. Among the food processing equipment manufactured by us: stainless steel tanks, cookers, vacuum reactor of stainless steel vacuum vessel of stainless steel, tempered stainless steel tanks, storage tanks of stainless steel produced by standard and custom screw impeller pumps and, homogenizers, Installation termizatsii, zhirotopki, grease, melter, vacuum tumblers, vacuum mixers, homogenizers, dispersing machine, the installation of homogenization, autoclaves, cooling tunnels, Enrobing and tempering machines, cookers, dissolvers, zakvasochniki, drum, rotary, belt, screw mixers, heat exchangers machines, ball mill food, bakery equipment, meat processing equipment technology equipment for the baking industry baking pastry pasta equipment for confectionery packaging bakery baking bread rotary meat processing equipment for meat processing equipment meat processing meat processing meat processing equipment for storing low-temperature freezing chamber freezers compressors coolers water coolers units prefabricated industrial Automatic cold storage of fish meat ice makers shock freezing cooling liquid heat transfer tunnels monoblocks sewage treatment wastewater treatment plant food, equipment for production, processing, food processing, manufacturing, dairy, for, filling, packaging, packing, packaging, tanks, refrigeration, machinery, meat processing , processing, milk, meat, fish production, yogurt, sour cream, butter, canned goods, preserves, juices, drinks, mayonnaise, vegetables, fruits, vacuum, cutter, syringe, pasteurizer, mixers, dosing, food, food, machine, filling , food, container, stainless steel, tank, tank, tub, cooling, automatic line, Packer, applicator, labeler, packing, machine, filling, clipping, filling, packaging, labels, for, food, industry, technology, process, recipe recipe and technologies for food production equipment, equipment for processing food raw materials, processing of vegetables, meat processing equipment, fish processing, tank equipment All types of capacitive, pumping, filling and other equipment for processing food, cosmetic and chemical products. Line (juice, mayonnaise, etc.). "Designing, manufacturing engineering, and more. If you have a problem in the design, equipment selection and development of new combined units, please, we will from any technological complexity of the situation to find out. Automatic packing in plastic cups, buckets, etc. Automatic filling and packing of bulk products (seeds, nuts, coffee, etc.). Automatic line filling and capping of liquid, viscous, pasty or gel-type (grease) food in plastic containers such as "bucket". Oranges. Equipment for juice from oranges, mangoes, etc. Drum Mixer - Review (anime). Drum mixer with a cylinder - drum biconical. Vacuum evaporator for ekstrata from licorice root. Vacuum mixer homogenizer-series VMG-Korum (anime). Vacuum reactor with coaxial stirrers. Jam. Production line of preserves, jam, marmalade (Universal). Gel. Equipment for the gel. Homogeneous unit. Installation for homogeneous cosmetic products. Cem. Liniiya podvarok, jams, fillings, jams. Diet food. Equipment for the dietary and nutritional therapy. Zhirotopka (melter, masloplavitel, tomilka-zhirotopka, maslotopka) for the production of margarines, combined oils, ice cream, condensed milk, fillings, creams, ointments, greases, etc. Potatoes. Drying potatoes (fruit and vegetables). Kvas. Equipment kvass. Kvass line. - Home. Nutritional therapy. Equipment for the dietary and nutritional therapy. Line of kvass concentrate leavened by fermentation of wort. A line of non-sterile ointment (mini) with the rise of the mixer. The line of canned milk. The line of mineral water. Cooling line of seafood (shrimp, squid rings, mussels, etc.). Beer Line 1000 l / day without cooling (similar to Czech). Brewery. Beer Line 1000l/sutki (analog Czech). Brewery. Beer Line 1000l/sutki without cooling (similar to Czech) Brewery. The line of condensed milk from a single. Line mixing dry food additives. Line of juices from mango, orange etc. The line of soap productivity of 600 kg / day. Mayonnaise. Mini Line (plant) sauces, mayonnaise, dressings and similar products with them. Milk fat. The line of milk fat. Soap. Equipment for the soap. Minced meat. Line production of ground beef. Non-sterile ointment. line of non-sterile ointment, etc. with the rise of the mixer. Equipment for the recovery of dry milk (juice concentrate). Equipment for the confectionery industry. Equipment kvass from concentrate leavened by fermentation of wort. Equipment for the cream, gel. Equipment for paints and varnishes (obz). Equipment for paints and varnishes. Equipment for milk (with a temperature of 140 degrees sterilization C). Equipment for natural oils and combined capacity of 1,000 kg / hour..
Equipment for cooling and freezing. Equipment for processing vegetables, fruits, and mushrooms. Equipment piva1000 l / day without cooling (similar to Czech). Brewery. and berries 1000kg/chas finished product. Equipment for the juice of mango, orange etc. Equipment for tomato paste, ketchup, etc. Pasteurization - the milk cooler. Brewery. Equipment for the production of beer 1000l/sutki (similar to Czech). Food dobyvki. Line mixing dry food additives. Planetary Mixer (dissolvers) for the production of high-adhesives. Semi-automatic packaging of liquid, paste-like products in the package "Doy-Pak"
Semi-automatic machine for packing and wrapping bulk goods in bulk dispenser. Siropovarochny boiler (electric heating) - Serial - anime. Siropovarochny boiler - electrical heating (anime). Cream. Equipment for the cream. Mixer type tumbler salads on analogue import. Mixer with two horizontal shafts - series (anime). Mixer with two horizontal shafts - two-rotor mixer (anime). Mixer loose components such as "drunken barrel"
Colod. Equipment for the production of malt. Colod. Equipment for the production of 100 tons of malt. Drying potatoes (fruit and vegetables). Stew. Equipment for the stew. Packaging machines. The design of packaging machines. Set homogeneous for cosmetic products (anime). Setting the dispersion of carbon. Set cooking sauces, mayonnaise, dressings and similar products with them. Packing loose, lumpy or powdery products. Filling and packing machine such as "Doy-Pack"
Fruit juice and juice of seaweed. Production line. Refrigeration equipment. Equipment for cooling and freezing. Screw feeder with your weight batching. Auger mixer. Installation of mixing. Chocolate glaze. The line of chocolate-coated intermediates.